I’m a thinker. When a stressful situation occurs, I am capable of calm problem-solving, and can usually solve the problem at hand so everyone benefits (this also taps into the “people pleaser” aspect I have). I usually set aside my feelings and get on task. However, when stressful situations keep happening, and I have not spent time addressing the emotional aspects of each situation, this means all the emotional energy builds up. Then I “explode” – this looks like snapping at my daughter, threatening to throw her toys away if she doesn’t pick them up right now (at this point, I’m usually aware enough to realise I sound like my mother, but that awareness isn’t helping me emotionally-regulate), using an angry voice with my husband, and rage-cleaning. If we look at the word “emotion” as “energy-in-motion”, we can understand how our feelings need to be expressed. All that bottled-up emotional energy needs and outlet, and this is where we look at emotional regulation. Firstly, I want to say that allowing all that bottled-up emotion to come up just as they are is OKAY. In a society that values thinking over feeling, where children are often told their feelings are wrong, where boys are told they can’t cry, where women are laughed at or ridiculed for being emotional, where women automatically apologise for crying, where “keeping a stiff upper lip” when dealing with grief and loss is admired… we have a problem. We have a big, complex, problem. We struggle to name feelings. We struggle to identify what we are feeling. We stuff our feelings with distractions and addictions. We freeze, flight or fight when others are showing emotions. When in our childhood, we have not been taught to acknowledge our feelings as they are, and go with the natural flow of feelings, we do not learn the energy of emotions. We do not learn that we are okay with our multitude of feelings, that there is strength and power in emotions. We do not learn emotional resilience. And without knowing emotions, how can we learn emotional regulation? How do we make space for emotional expression? How do we prioritise emotional processing? This diagram above may help you start that process for yourself. 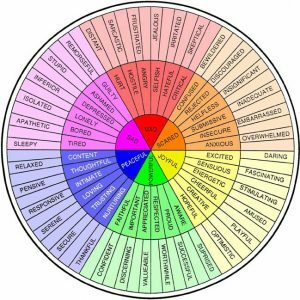 It’s the Feelings Wheel developed by Dr Gloria Wilcox and shows 650 different emotions. Print the wheel and have it at hand for easy reference to start with. You can simply start with this sentence, “I feel ….”, and pick one feeling to focus on. Spend a minute to feel this emotion (often you’ll find that you won’t even need a minute to feel this emotion. Paying attention to the feeling helps shift the energy). Practice doing this daily to get used to the process. Try it for 3 weeks. When you feel a mix of emotions at once and you feel about to “explode”, get yourself a piece of paper, put a timer on for one minute, and write down all the emotions you feel. When the minute is up, ritually get rid of that piece of paper – bury it, tear it to pieces, scrunch and toss, burn it (being mindful of safety), etc. This process can be quite cathartic. After 3 weeks, you can deepen your practice by using this sentence, “I feel …. because ….” . This starts to help you engage feeling and thinking together, in other words, linking head and the heart. 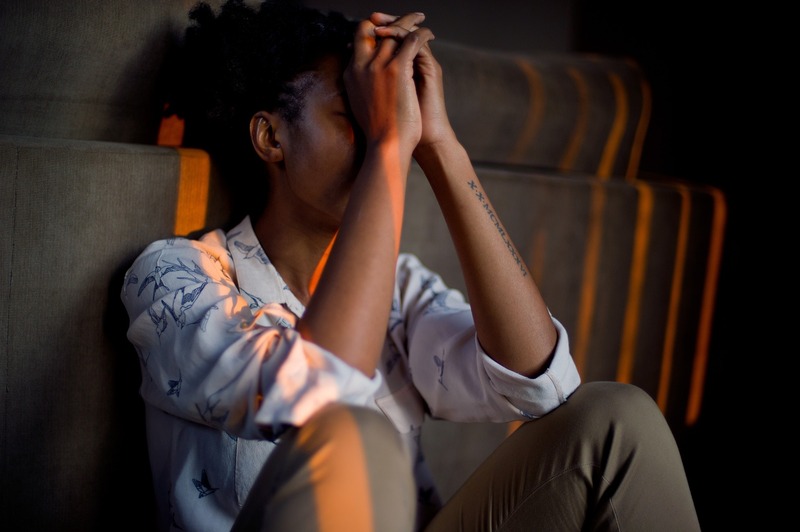 As a thinker and a counsellor, I’ve spent years learning to navigate and regulate emotions, and I’m still learning and practising, and I still need external help. So I wish to tell you that it is an ongoing process, and that if you need help, please seek a counsellor, psychologist or coach that you resonate with, and that it is okay to try out a few to find someone you can work with on an ongoing basis, because CONNECTION helps emotional regulation. A good therapist or coach, in their connection with you, will help you connect within so you can learn and practice emotional regulation, and connect head and heart. In Australia, you can contact your General Practitioner to organise a Mental Health Care Plan (MHCP), which allows you to see a psychologist for 6-12 sessions per calendar year. Some psychologists bulk-bill so you do not pay a gap, with other psychologists there is a gap fee. Check out the psychologist first via their website or online listings, and contact them to see if they bulk-bill or there is a gap fee to pay. Then contact your GP to organise the MHCP. Counsellors, psychotherapists and art therapists are also options to consider, and generally you can check out their website, social media or online listings to get a feel for how they work. If you are interested in how I work, this is the link to my services page, where you can opt to book online via the booking tab.